“Life was very much a family one” (35). I gathered from Mary’s memoir that family is one of the most important aspects of life to her. Apart from when describing her outings with friends when she was a teenager, the rest of the memoir is focused on her many family members and her life at home. 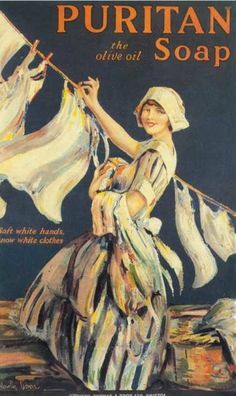 Puritan, washing powder advertisement 1910. One of the most significant family members to Mary was her grandmother who she described as “a formidable but humorous and affectionate figure” who “dominated the household” (3). It is clear that she very much admired and respected her grandmother as she spent and enjoyed a lot of her time at her grandparents’ house. She also described her to be “always busy” and “very occupied” (5) whilst her grandfather “spent most of his days in the house” (3) before he died, showing that her grandmother was the one to do the housework. This would have been routine during the first half of the 20th century as women were expected to cook and clean whilst men worked. However in this case, her grandmother still underwent her roles within the home even when her grandfather stopped working. Whilst Mary does not discuss her mother in a similar manner, I can see that they were close from when she expressed how much she missed her when she left for college and how distraught she was when she passed away. Not until Mary was in her late teens did her mother work, therefore remaining in the family home when she was progressing through her childhood. She “learnt to dress make and was a very good sewer” (39) since she may have had spare time whilst Mary was at school. Joanna Bourke discusses the significance of women in the home by stating that “the full-time housewife reaped more of the benefits of increased leisure when compared with women working a double-shift in the factory and the home” (67). This suggests that women who do not work were happier than those who do. This is reflected in Mary’s memoir as when recalling the memories involving her mother, they are relatively positive. Also very close with her family was Winifred Relph, and like Mary, was also born in 1912. Lucy Murray gathered from Winifred’s memoir Through Rough Ways that “her family and the family unit is the main theme of her memoir. She proudly discusses each of her family members in great detail and it is clear how important these relationships were to her”, which could also be said in relation to Mary and her family. This shows the importance of working class families remaining together and therefore having a significant influence on each other. However, the development between generations can be seen when Mary explained that her “aunts and mother were very fashion conscious” (9) and her mother “wore her hair in the fashionable pompadour style” (35) showing that the modern women of the time were not as occupied with housework and spent some of their time thinking about their appearances by making fine clothes. In contrast to her relationships with her grandmother, mother and aunts is her relationship with her father. She described him as “very strict” and “was never smacked perhaps this was because I daren’t disobey” (34). This suggests that she was not relatively close with him as she feared him. As the family breadwinner, he worked as a “cloth looker, checking for faults in the woven cotton before it left the mill” (33). Julie-Marie Strange stated that “For working-class autobiographers, key milestones in the shifting dynamic of relationships with fathers included the transition from childhood dependency to wage-earning independence and becoming a parent” (37). This is relevant in Mary’s memoir as her father “had decided quite early on” (58) that she was to complete school and attend teaching training college “but without any discussion” (59). However, she saw something positive from his strict parenting as she “loved teaching so my father chanced to be right” (61) suggesting that despite not being very close to him, he played a significant part in giving her a happy career and future. Murray, Lucy. ‘Winifred Relph (B. 1912): Home and Family’, Writing Lives, November 2, 2015. Strange, Julie-Marie. 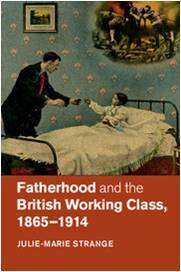 Fatherhood and the British Working Class, 1865-1914. Cambridge: Cambridge University Press, 2014. Image of a advertisement for Puritan washing powder. Cover of Fatherhood and the British Working Class By Julie-Marie Strange. One Response to "Mary Hollinrake (b. 1912): Home & Family"